Eight times an Open Championship venue, Royal Troon was the fifth Scottish course after Prestwick, St Andrews, Musselburgh and Muirfield to host the Open. Troon was founded in 1878 as a five-hole golf course following a meeting in the local pub by a group of golf enthusiasts. It was Charlie Hunter, Keeper of the Green at Prestwick, who laid out the original course and a few of his greens are still in play today. George Strath, Troon's first professional, later extended the course to twelve holes and then to eighteen by 1884. Willie Fernie and James Braid later modified and lengthened the layout. In 1923, Royal Troon Golf Club hosted its first Open and finally moved out of the shadow of its famous neighbour, Prestwick. (By 1923, Prestwick had already hosted 23 Open Championships). "The course at Troon is perhaps a little overshadowed by its more famous neighbour," wrote Bernard Darwin in his 1910 book, The Golf Courses of the British Isles, "but it is a very fine course nevertheless, especially since it has been lengthened of late years. It has, moreover, one of the finest short holes to be found anywhere." In 1978, Troon’s centenary year, royal patronage was bestowed. Royal Troon Golf Club remains the first (and last) club in Great Britain to have been granted Royal status under the long reign of Queen Elizabeth II. 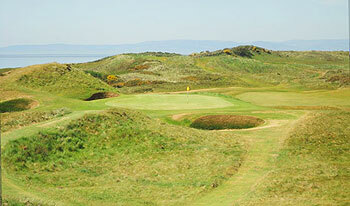 Royal Troon is a traditional out and back links course. The opening few holes are relatively gentle, with a series of short par fours running along the Firth of Clyde. It’s from these early holes that you get the chance to soak up the views. On a clear day, you can see the distant Ailsa Craig in the south, and to the west, the majestic mountains on the Isle of Arran. The course measures 7,208 yards from the championship tips but line is more important than distance from the tee. Bunkers are everywhere, the majority of which are not visible from the tees. There’s plenty of deep rough and a smattering of gorse and broom to punish the wayward shot. Make your score on the outward nine holes; the inward holes are severe, often playing into the prevailing northwesterly wind. The stretch of holes from the 7th to the 13th provides an interesting and varied challenge. The 6th is the longest par five in Open Championship golf and the 8th the “Postage Stamp” is the shortest par three on the Open circuit (123 yards). The name stuck after Willie Park referred to the hole in an article for Golf Illustrated: “a pitching surface skimmed down to the size of a postage stamp”. It was here, in the 1973 Open, at the age of 71, Gene Sarazen holed out in one. The following day, he holed his bunker shot for a two at the same hole. It was an amazing return for Sarazen, who had played in Troon’s inaugural Open in 1923. The 11th is a brutal 490-yard par four for the pros and was rated the most difficult hole of the 1997 Open Championship – out-of-bounds and the railway line runs along the right hand side. In 2004, the Open Championship returned to Royal Troon for the eighth time. It was an exciting tournament. Ernie Els had a ten-foot putt for the Claret Jug on the 72nd hole but missed and then lost to Todd Hamilton in a play-off. I played Troon 5/9/17 and had a delightful round and experience. The old course at Troon is "good" but not more when compared to other top clubs and when considering you've just paid the 230 pound visitor fee. It is all relative, I am not comparing this course to your local average muni but rather judging this course on par for its caliber. I have played about 40 of the top 100 clubs on this list, all of the Open courses, and about 30 top 100 courses in the USA. The club house is beautiful and worth spending some time in. It has been remodeled and is lovely inside. The golf shop for an elite club was disappointing regarding it's selection of merchandise to take home. The staff all around was very welcoming and helpful throughout the day. The golf course - it is a wonderful experience anytime you get to play an Open venue course so this is a real treat to play, but no way is it worth the price of admission and you should not go out of your way to play it. There are better courses for half the price. Holes 6, 7 - 15 & 18 are the best, the rest are average or even below average for a course of this caliber. The bunkers are fierce as one would expect, the course conditioning was very good, the greens were a bit slow. The "sand dunes" are really only prominent on holes 7-11, otherwise holes 1-6 and 12-18 are flat (flat for a links course). The golf course really isn't beautiful or interesting, there are a few spots where the course has some interesting design features and some nice views towards the water but nothing to go crazy over. For me, holes 7-11 are the course, without those Troon is a bottom 50 course in this ranking list (sorry but it is true). I had a lovely time playing Troon and a memorable experience on an Open venue but the course is a flop (when compared to its peers at the elite end of the Top 100 list and considering the price to play it). I’ve not played Royal Troon, but I’d suggest ignoring the above summary. For a self-confessed student of Golf architecture, this reviewer talks rather alot about poor value for money in his reviews. All whilst handing out 6 ball reviews to ultra private (and therefore ultra expensive to join) US clubs. Playing Royal Troon less than a fortnight after Henrik Stenson and Phil Mickelson had produced what is arguably the greatest golfing duel in history, and certainly the best final day of an Open Championship, was a special occasion. With the spectator grandstands still in place I really got a feel for the course that I’d witnessed on television just days previously. The Old course at Royal Troon is not often lauded by many. It is a beautifully looking links in my opinion but it doesn’t have the stunning scenery of nearby Turnberry, the history of St. Andrews, the demands of Carnoustie, the quirk of St. Georges, the dunes of Birkdale, the reverence of Muirfield nor has it produced the great players that Hoylake has. That said, the course exceeded my expectations and whilst I can’t really argue with any of the above statements in many ways it has a blend of everything which produces an extremely satisfying round of golf. In some ways this makes Troon a jack of all trades and master of none… but don’t fall into the trap of thinking this isn’t great golf; it’s a bloody fine links. Undoubtedly the best part of the course is holes seven through to eleven though. Walking onto the seventh tee gave me a similar thrill as stepping onto the third tee at Dornoch or the ninth at Cruden Bay and whilst Troon may rank third in this trio the view, which primarily takes in the hole itself, the famed Postage Stamp and a vista out to sea is spectacular. Ed is the founder of Golf Empire – click the link to read his full review. The postage stamp is a very noteworthy hole on a course that lacks many standout holes. I know I am in a minority in not loving Royal Troon but I found a bunch of the holes to be rather straightforward and uninteresting. The former editor of Golf Magazine, George Peper's description is more eloquent and concise than mine but in the same vein: "Six dull holes - six interesting holes - six dull holes." Relative to other courses that host the Open Championship or others in England I find Troon to be overrated. Ah, Royal Troon. We played it four years ago on a day that was so wet, dark and windy, it made it nearly impossible to appreciate. We scheduled it again, hoping for a better day, and we were rewarded with a beautiful day, sunny and mild. The outward nine, in my opinion, is the better half, particularly the beautiful number 7, a par four with magnificent views from the tee, a dogleg right that is stunning all the way through. You follow that up with the revered 8, the Postage Stamp, which might be the shortest hole in championship golf, but it is certainly not the easiest. The back nine I found a bit more mundane, but I'm sure it must be aesthetically more pleasing from the back tees and will provide a great test for next year's Open Championship. A challenge, even in fair conditions!We were lucky enough to play Royal Troon in mid-May in what for this area, was probably pretty benign conditions. There was a decent breeze and it was cool, but dry. Overall my view is that this a great test of your game, but not the most stimulating course visually. It’s a typically old fashioned links course in that you head away from the clubhouse for the front nine and then return from there. The front nine was slightly into the breeze when we played, making the holes somewhat longer than the yardage would lead you to believe. However I can’t say that it is the most memorable start. For me the course really comes alive at the 5th, a tough par 3 alongside the beach, to a slightly raised green. This is followed by the longest hole in British championship golf, protected from the sea by the biggest dunes on the course. The 7th is then the start of the most visually satisfying stretch – a wonderful par 4 from a raised tee, where you eventually fire at a green set amongst the dunes. This is followed by Troon’s most famous hole – the Postage Stamp – the shortest in British championship golf. A wonderful golf hole and proof a par 3 does not need to be 200 yards plus to be difficult. The 9th, 10th and 11th are all wonderful holes in my view, with the latter particularly offering a hugely challenging drive, with a sea of gorse down the left and the railway down the right. From there it’s a series of solid, demanding holes, rather than anything spectacular, as you head back to the clubhouse. All good, but not outstanding. No easy pars anywhere. The welcome in the clubhouse before and after the round was superb, and efficient. I am sure it’s a fabulous place to be a member. My only other slight disappointment was that there was nowhere, near the clubhouse, to warm up before the round, not even a net. The driving range is some way away, so make sure you arrive early - it's not a course to be tackled cold! The first six holes run along the coastline in a southerly direction. After a gentle opening par four, the 2nd is somewhat more difficult because of the presence of seven fairway and four greenside bunkers. The par thee 5th is very close to the shoreline so any lofted tee shot is likely to be wind affected. The 6th is the longest par five on any of the Open Championship courses. Three bunkers are in place for the drive. The green is in a lovely setting with dunes on both sides and out of bounds at the back. The next six holes are probably in the most interesting terrain with dunes more prevalent. The elevated 7th tee provides a wonderful outlook over this hole which bends to the right around the ‘Postage Stamp’ 8th. From the 13th, all holes run in a northerly direction back to the clubhouse. After two par fours and a medium length par three, the 15th is the start of four very tough finishing holes. Fifteen is a par four of 481 yards with three bunkers waiting for the drive and a further three closer to the green. The 17th is the most difficult of the short holes. At 222 yards, it can be a very long par three into the wind. The 18th is rated index 17 – presumably based on the medal tee length of 374 yards. However it is 453 yards from the championship tee which makes it a long par four. This review is an edited extract from Another Journey through the Links, which has been reproduced with David Worley’s kind permission. The author has exclusively rated for us every Scottish course featured in his book. Another Journey through the Links is available for Australian buyers via www.golfbooks.com.au and through Amazon for buyers from other countries. I played the old on September 2011 and was lucky to come back on late May 2012, with a 25C sunny and no wind day, perfect conditions! I had a little defeat when I arrived to the Club in golf bermudas and was adviced I needed long trousers!!! So 60GBP for a new pair of blue trousers and now ready to play. We were a group of 36 Argentine golfers and all of them loved the course, I assume helped by the perfect weather and the great scores we had. Last year I was proud with a par on Postage Stamp, this year I birdied it!! The course was getting ready for 2012 Amateur Championship so it was in great shape, despite as the greens were slower than 2011 as they were protecting them. Did I find something new I could not get last year? Yes. Hole #7 is a piece of art, the tee shot has to be really accurate. You can play yellow tees (6300yds) and still find it tough and challenging, no need to go back. Hole 15th is another great one that last year maybe I ignored due to how good I found 8th and 11th. Is it the best course? No. But yet it is a real test for low handicappers. Is it nice? Maybe not as Turnberry, Castle Stuart or Kingsbarns. Is it a must? You have to play it once at least, but I believe The Saltire offers some better courses ahead of this one. Said this, I spent a great day and the Club Staff remains at the highest levels. Click to read my full story: 13 Courses in 13 Days. I have to sya I had the highest expectations on this course and after one month of having played it all I can say it is a great venue, despite there are other courses I liked more. A big star for the greens, the best kept in all our tour, by far. The course is very challenging and some holes take the very best of you, such as 11th, 13th, 15th in the back nine. I can share the proud of GIT and 2 putt for par at Postage Stamp and up & down from the right side for a par on Railway, the toughest hole on the course. The Club Staff led by Peter, The ProShop, Caddie Master and Restaurant are really high class, worth of staying all afternnon inside it. If you plan a trip to Scotland, make sure there is availability because the Old is a really "must". I think Troon has had a bit of unfiar criticism on this site. The course is absolutely fantastic - both in terms of condtion and layout. I played in great weather in April and couldnt believe how good the condition of the course was. The feel of the place is complete class from the minute you arrive until you have your post round drink in the incredible clubhouse. Standout holes for me were 6,7,8 and 11 (11th is a brilliant hole)and in truth the back 9 is not as good as the front. The finish is tough but not as visually appealing as the first 12 holes but hitting up the last to the clubhouse is a great experience. The course has a lot more elevation changes than I was expecting and the views from the 7th tee were on a par with anywhere in the world. I couldnt compliment the course highly enough, it blew Turnberry away (which we played the following day) and I think it may be overall slightly better than Carnoustie (although Carnoustie's last 6 holes cant be beat). It is definately one of the best 3 courses on the open rota. Not signed up yet? Join now!